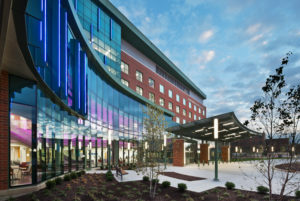 In 2015, Akron Children’s Hospital completed the first phase of a 20-year master plan with the opening of Kay Jewelers Pavilion, a $180 million, 368,750-square-foot facility that substantially upgraded its downtown Akron main campus with a new emergency department, neonatal intensive care unit, outpatient surgery center and high-risk labor/delivery center. 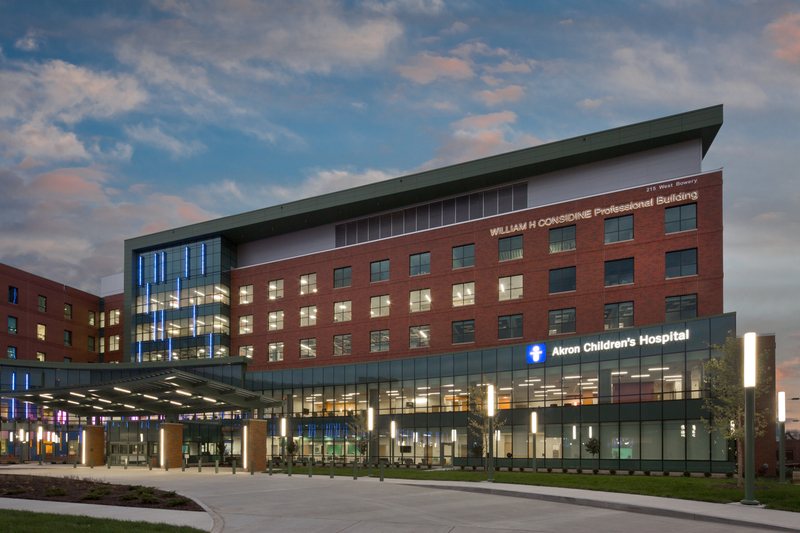 This year sees Northeast Ohio’s largest pediatric healthcare provider continuing an effort to meet growing demand with its latest completed building project, the newly expanded William H. Considine Professional Building. 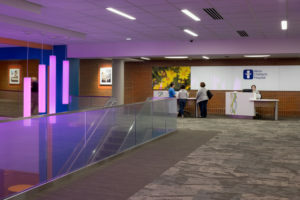 The existing seven-story facility, constructed in 2004, has been reconfigured and modernized with and addition that nearly doubles available space from 250,000 to 480,000 square feet, enabling Akron Children’s Hospital to consolidate outpatient programs and place them in once centralized, easy-to-navigate facility. Departments currently open or soon moving into the building include Adolescent Medicine, Behavioral Health, Dermatology, Gastroenterology, General Surgery, Genetics, the Locust Pediatric Care Group, Ophthalmology Rheumatology and Sports Medicine and Rehabilitation, plus and outpatient pharmacy, lab and the hospital’s Neurodevelopmental Science Center. “This building brings all of these high-demand services together under one roof to create a one-stop opportunity for families and children,” Says Lisa Aurilio, Chief operating officer at Akron Children’s Hospital. Continuing a design approach first utilized at Kay Jewelers Pavilion, the entire facility is designed “through the eyes of a child,” with vibrant color choices and furniture selections, wall-sized murals incorporating photos of area youngsters at play, artwork created by young area artists and whimsical exterior lights that change colors at night. The design focuses on even the smallest of details, notes Holly Pupino, senior corporate communications specialist. “When you’re in the elevator, you’ll even hear the voice of a children saying ‘going up!’ she says. 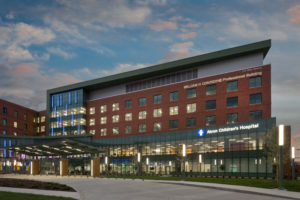 Akron Children’s Hospital CEO Grace Wakulchik, MSN, notes that while the Considine Professional Building expansion was first envisioned nearly a decade ago as part of its overall campus master plan, the project actively began to says take shape in 2015. 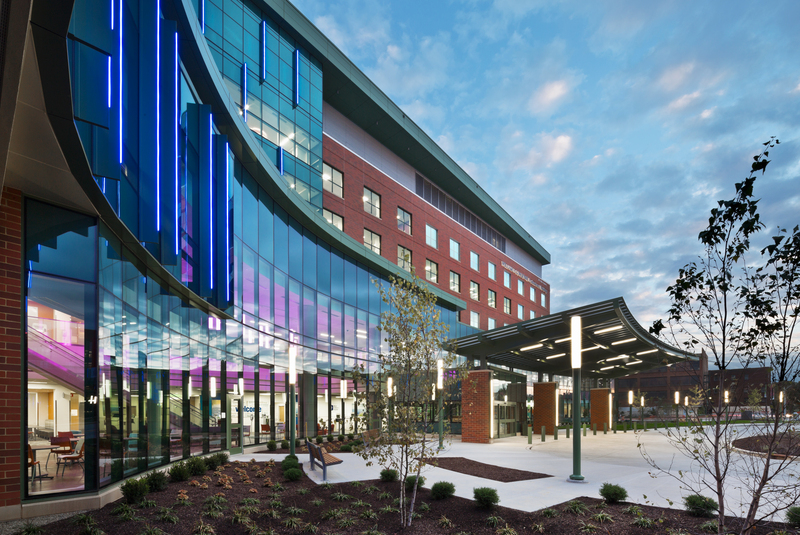 Inspired by the successful completion of the Kay Jewelers Pavilion project, Akron Children’s Hospital returned to the same core design/construction team of Welty Building Company and Hasenstab Architects to realize its vision for the Considine Professional Building expansion. As with that project, the hospital chose to utilize an Integrated Project Delivery (IPD) model, which incentives collaboration throughout the entire design and construction process by linking stakeholder success to the overall success of the construction project, while also incorporating Lean Six Sigma principles to drive down waste and increase efficiency. Don Taylor, president of Welty Building Company, notes that the Kay Jewelers Pavilion project served as a benchmark during design and construction of the Considine addition. Driving down costs is important, Taylor says, but adds that it was just one component measured by the team when evaluating the project’s success using IPD strategy. efficiency, and staff and family satisfaction.” Another goal was to only utilize local talent, he adds, so 100% of labor was directly from the areas served by Akron Children’s Hospital. The intensive planning process required a lot of coordination upfront, but ultimately allowed the building to be constructed quickly, Taylor notes. “Adapting to the latest technologies allowed us to accelerate construction and push costs down, while driving quality up,” he says, noting widespread use of cloud-based 3D building information modeling throughout the project. Greg Komar, project manager with Welty, explains that the team modeled its prefabrication process after automobile assembly lines, creating a consistent, effective production system. 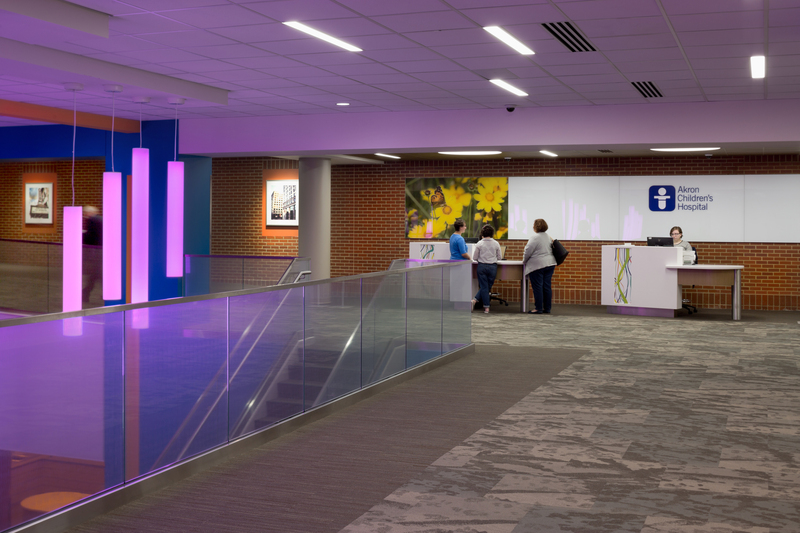 Adopting an overall interior design theme of “Our Neighborhood,” waiting areas on each floor are differentiated with their own unique color palette and art choices that “reflect a different aspect of what a neighborhood in Northeast Ohio can be,” Zezulewicz explains. For instance, there’s a transportation floor incorporating images of the Goodyear Blimp and Soap Box Derby cars, while another floor features a countryside theme with images of farm equipment, livestock, and barns. Beyond waiting areas on each floor are patient rooms and additional clinical facilities, while staff areas – including a variety of closed offices, collaboration rooms, touchdown locations, and meeting spaces- are arranged along the back of the building with views toward the Canal Park baseball field. To ensure future flexibility, office areas are constructed with demountable partitions, which allow the hospitals to add or subtract offices and open work spaces as needs evolve. “Utilizing demountable partitions allowed us to really maximize the square footage in this building,” Lapolla says. Providing additional flexibility, the building includes 31,250 square feet of shell space to accommodate future growth.